The master bedroom has a Queen sized bed with brand new mattress. The second bedroom has two sets of bunk beds and pull out trundles below. Both bedrooms have separate full bathrooms. The living room has a new couch with a twin pullout sleeper. All the rooms are equipped with TV's and ceiling fans. There is WiFi and a Bose ipod dock as well as a DVD player. All in all it's very comfortable and accommodating. I've been coming to Stratton for over 30 years and it seems to get better all the time. I live in Rye, NY. I chose this property because it was so convenient to get to and so convenient once we got here. I love the skiing/boarding and love being so close to the village. Meeting friends and family for dinner and/or drinks in the village is great because it's so close and there's no need to get in a car to get there. Mountain Watch is perfectly located. Get on a lift out the back door and ski home for lunch with your family makes this place ideal. When you're done skiing, shop or get a massage in the village. Meet friends or take your family out to dinner if you don't feel like cooking. All in all you'll have no worries once you arrive. Master bedroom's bathroom has a jacuzzi tub, double sink, and heat lamp. Minutes walk to Sports Center, short drive to golf course during summer. Adjacent to the Charming Stratton Village. Enjoy Shopping, Cocktails and several great restaurants. Living Room and Bedrooms look out toward Bromley. Super convenient to both the Villager and Tamarack Lifts. Ski home for lunch and a nap. Just steps to both the Villager and Tamarack Lifts. Extremely convenient if you have young children. At Sports Center. Ask owner. We had to keep the windows cracked at night as the room was so warm even though we had the thermostat set for 55 degrees. There may have been an easy solution had we called Bill which i didn't so that may have been my fault. As a result we could hear all of the early morning street noice. Had i figured out how to control temp this would not have been an issue. There was about two days worth of fire ashes in the fire place. That should have been cleaned out before arrival. Also i would suggest some kind of kindling or duraflame log. since you cant arrive until after 4pm you get there after the stores have closed (where you can buy a duraflame log) I could not even locate matches to start a fire; again probably my bad as I'm sure there were some matches somewhere. But it would have been nice to have had all of that by the fireplace as I've seen in numerous other rentals. The kids beds were apparently too hard. both of my kids (7 and 6) ended up sleeping with us or on the couch. my wife also said that she tried the bunkbed one night but the mattress was uncomfortable. there is no garbage disposal which might be a regional issue. My last issue is that this place kind of felt like i was staying at my cousins ski condo except that i had to pay for it. The closets were filled with owners clothes, their ski equipment was in bedrooms and laundry cubby, personal items in bathrooms,.... it felt very lived in rather than sanitized. To be fair, my wife said that it didnt bother her and that she would rather have it this way than having to go and buy salt, dishwasher detergent coffee etc. The place was well stocked. The location is nice and easy for ski in or walking into the very small town. Overall i personally don't feel this rental met my expectations for the cost. I’m very sorry that you’re expectations weren’t met. I’ve followed up with the caretaker to see if there is anything wrong with the heating system or thermostat. He checked and verified that it was working as it should. He did mention that the unit below likes to keep there place hot because they have a newborn. Likely this was the problem. Unavoidable but still apologize that you were uncomfortable. I’ve made a note to insure that matches are easily found and that kindling of sorts is also available. As for the clothing and equipment, I leave more than half the drawers available for renters and make a point to keep clothing on one side of the closet. As far as I understand, clothing in Homeaway properties is relatively common. Fits with the concept of renting ones vacation home when not being used by oneself. The laundry room cubbies are empty except the one that contains spare goggles that I’ve accumulated and have in the past been used by guests that either forgot them or damaged them while they were visiting. You mentioned the personal items in the bathroom. I keep my toiletries under the sink in Tupperware and leave the medicine cabinet absolutely empty. Other than hand soap and moisturizer, the bathroom sink area is empty. I understand that my home didn’t meet your expectations but I wanted to insure that anyone reading your review also heard my voice as well. There have been so many people that have been generous in their reviews and I encourage anyone reading this one to also please read the others. If anyone reading this has any questions for me please contact me through the website and I’ll be happy to talk to you. Again, I’m sorry that the stay wasnt what you were looking for and wish you luck in your next choice. 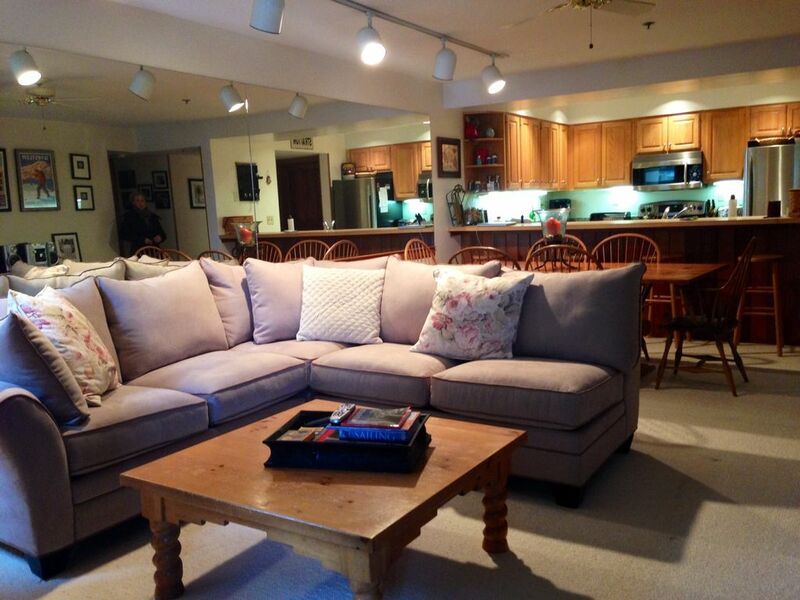 Ideally located & comfortable condo for your dream ski vacation! Lots of room and well-stocked kitchen. We enjoyed the wood-burning fireplace and other amenities. Plenty of storage. Secure, close outdoor parking for two cars. Extremely well-located to the village and lifts. Bill was diligent in keeping us informed and answering questions. An excellent choice for a family gathering or ski get-away! Thank you so much for the favorable review. We hope to hear from you again in the future. This was our second time staying here. It's a perfect location with the ski lift steps away. Plenty of room for our stay and nicely furnished. Bill is very easy to work with and always available for any questions. We plan on staying again in the future. Really nice to hear that your stay was successful and I’m thankful that you keep coming back. Keep in mind that we also have a couple one bedroom units over at long trail if you ever need a smaller place. Condo was great, close to the main town area, walkable to the lift, everything was great! Bill was very accessible and helpful--a wonderful experience! Charming and an amazing location! This condo is perfect for a weekend in Stratton. The condo was clean, charming and the location could not be better. Bill was communicative and a great host. We would be happy to come back to this condo anytime we visit Stratton! Thank you and I’d love for you to visit again. Glad it was a successful trip. Remember that summers at Stratton can be a lot of fun with tennis, golf and great live music. Ideal location, Attentive Owner, A Def Must!!! We rented for the week of 1/27 and have also stayed here Aug '17. Due to a non-owner related issue, their was a little snafu w/the condo not being thoroughly cleaned but when we called Bill he sprang into action. He was immediately all over this! He was apologetic, attentive and did everything he could to correct it. I was impressed and that's hard. The condo easily sleeps 6, we only had 4 in our family but we had an additional 6 for dinner and hanging out every night and never felt crowded. HUGE table that sits 12 easily, great living room for games and hanging out by the fire and an accessible deck that we do utilize Winter & Summer. It is truly Ski in/out, great ski storage and a 5min walk to the Village. This is a GREAT condo for couples, a family, skiing, hiking, you name it. STAY HERE & you won't be disappointed!!! Bill is an awesome owner and we will be back, Stratton is a Fav! Thanks so much for the rave review and thanks for your understanding when it came to the “snafu”. When it comes to the hospitality industry, things don’t always go perfectly and while I do my best to make sure very little goes wrong, there are those times when they do. I appreciate that you recognized that I responded quickly and positively to your issues. My goal really is to make sure I provide the best experience possible. Owning this place has been such a great experience not only because it’s been great for my family but I also know that others that visit like you get to enjoy it and Stratton overall which I’m a big fan of. Please visit again. Mountain Watch is located just below the Villager and Tamarack lifts and is adjacent to the charming Stratton Village. Shop, eat, meet friends for drinks or enjoy a massage and/or spa treatment. If its winter and you're coming for skiing/snowboarding then you'll love the convenience of your proximity to the lifts for getting out on the mountain and for getting home afterward or even for lunch. If you're visiting during the fall foliage season or during the spring or summer you'll have access to hiking out the back door. Tennis and golf (27 holes) is a short (2 minute) drive. Look at the Stratton website for more information about the resort and for an updated list of activities and events.